Go inside Brian Giniewski's studio for an exclusive video interview, and witness the magic behind his drippy pots in the second video at the end of the article! You won’t find plainly colored pots in ceramist Brian Giniewski’s studio. Instead, Giniewski has created his own handspun wonderland of vibrant “drippy pots” made from his own homemade glazes. Giniewski discusses how this highly popular line first came to be and how he’s found peace through creating. After finishing graduate school at the Cranbrook Academy of Art in 2009, I took the academic route and moved through a bunch of one-year teaching positions at different universities in an attempt to find the holy grail of a tenure-track position. I was trying to make heady, conceptual art to bolster my academic portfolio, but it had zero commercial value. In 2013, I made my first batch of pastel drippy pots. It was the first time in my life that something I made actually had some sort of resonance or response from a broad audience. It took me about three and a half years of making them in very small batches on evenings and weekends before I decided to quit my full-time teaching job and open up my own business making pots. Do you come from a creative background? Are you self-taught in pottery, or did you study with someone? I really had very little exposure to art or design throughout my childhood, but I was fortunate enough to have a really amazing ceramics teacher at the end of my high-school career. I was a serious introvert back then and really didn’t fit in with any of the social groups at school. My teacher, Linda Austerberry from Boyertown Area High School in Pennsylvania, set up the ceramics studio as a zero-intimidation safe space where we felt like we could be ourselves, and she didn’t tolerate any bullying. Not only did that experience spark my love for ceramics, but it also plays a huge role in my teaching philosophy and the way I run my business today. I was even more fortunate to study with Deborah Sigel at Millersville University. Like my high school teacher, Debbie went so far above and beyond the role of teacher and was an incredible mentor, supporter, and friend to me during a really challenging and formative four years. She is still a very close friend and one of the first people I reach out to for advice in all aspects of my life. My studio is now the top floor of the Globe Dye Works building in Northeast Philadelphia. This building was a huge factory that dyed yarns for Philadelphia’s once vibrant textile industry, and now a bunch of young creative entrepreneurs have filled the space back up with our own small-batch manufacturing. I take a great deal of pride in knowing that all of my work is made here in Philadelphia and that this resurgence of making and manufacturing is being noticed around the country and around the world. How did the collaboration with Urban Outfitters happen? Would you have ever dreamed that for yourself? Because the URBN group—made up of Urban Outfitters, Anthropologie, Terrain, and BHLDN, among others—is based in Philadelphia, I run into designers and buyers everywhere. They are really savvy about checking out all of the local art and design events. After several run-ins at pop-ups and galleries, I had a studio visit with one of their buyers, and they eventually pitched the idea of this collaboration. It was a great opportunity to get more exposure from a leading brand in my field, and it taught me a lot about what it takes to work with a big company. 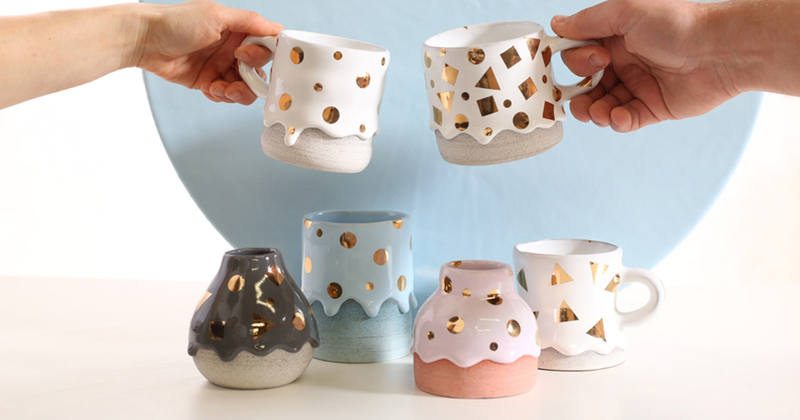 Take a peek at how Brian's drippy pots come to life! I like to think that I am referencing industrial design in my work but doing it in a way that allows for accidents and discovery. The glaze recipes that I use are all of my own making, and we mix them all in-house. During the hottest point of the kiln firing, the thick glaze literally turns into molten glass and oozes down the piece. I fire them in a computer controlled kiln, which I’ve programmed to turn off at just the right time to freeze those gooey drips in place. My goal in developing my current glaze palette was to make a material that had the same sense of “deliciousness” as the wet, viscous paint from those pieces. Was it scary when you decided to make pottery full-time? It was scary then, and it’s still scary today! I moved to Philadelphia with $5,000 and the dream of owning my own pottery business. I got a shared studio space, a kiln, and some materials, and hoped the orders would start coming in. Fortunately, they have continued to come in, and we’ve seen some pretty remarkable growth over the last two years. Share this ceramist's story with friends and family. Ready to send your own Digital Edition?